Earn attention for your special sale items or sales event with our On Sale sticker design template, perfect for clothing stores, department stores, and used apparel outlets. Available in three different color schemes, two shapes, and three distinctive edge finishes, you’ll find many uses for this versatile sticker design. 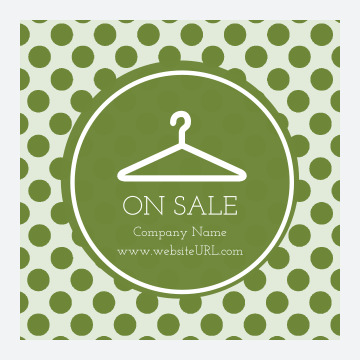 On Sale features a polka dot background with a colorful circular field in the center with an image of a clothes hanger and the words ON SALE and your company name and website URL below. On Sale can be used as an accent decal on flyers or bags, as envelope seals, or around your store to draw your customer’s eye to targeted sale items. Print custom stickers with our On Sale design template today! Our online sticker maker helps you design eye-catching custom stickers in minutes. Just select your professionally-designed template, then choose a color scheme and add your desired text. Once you’ve created your custom sticker design and tweaked it to your satisfaction, select your paper stock options and printing turnaround and place your order. You can even download a shareable free PDF of your design to get input from team members before you print your stickers! You can count on fast printing turnaround and reliability when you print custom stickers with PsPrint. Every order is backed by our customer satisfaction guarantee, so you know your stickers will be printed on premium quality paper stocks with vivid inks that make your design stand out from your competitors. Add in discount prices and it’s easy to see why thousands of businesses use PsPrint every single day. Interested in a unique, custom shape for your stickers? We can help with our custom die-cutting services. Or use our foil stamping services to add a brilliant shine to your sticker. Our custom printing team is available to assist you with printing the perfect sticker and bring your vision to life!